There is no right or wrong way to go about building your dream home, whether you start by finding the right location and block of land, or you select your perfect house first. However, buying land and building your home is one of the biggest undertakings you will make and can be quite daunting if you haven’t been through the process before. This should help you narrow down a general region in which you wish to live. Before you go any further, it’s important to establish your budget. When working out your budget you’ll need to factor in extra costs such as conveyancing, state taxes, duties and fees. Speaking to a Mortgage Broker regarding the right type of loan to suit your needs and obtaining a pre-approval at this stage, will make things a lot easier once you find your preferred lot of land. Now that you’ve done your research and established your budget, it’s time to find a block of land in your preferred location. Whether you have already chosen your perfect home, so need a block that will suit or have decided to lock in land first, there are a few things to remember. The cheapest lot could be the thing that blows your budget. Often lots are cheap due to things like fall on the lot, irregular shape and/or size, substantial levels of fill, easements position or other covenants, all of which are likely to result in higher site costs. Take into consideration, lot orientation, proximity to any major roads, public transport and/or parks, all of which may add value to your home in the long-term. 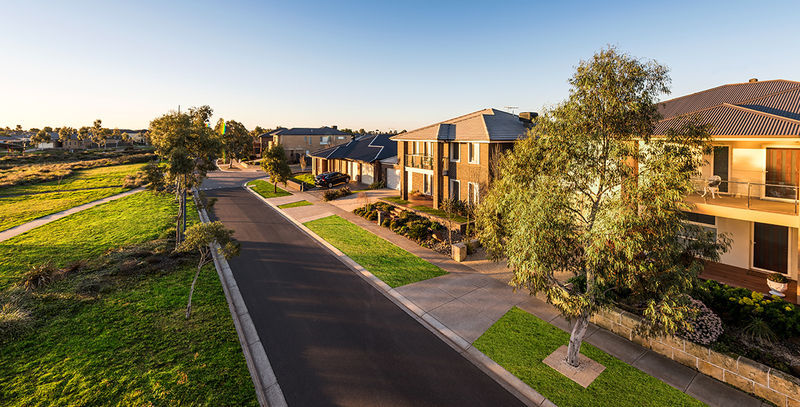 How do the Estate Design Guidelines impact the overall streetscape and what impact will it have on you when building? Is your preferred lot already titled and if not, when will it be likely to title? It’s important to remember that until your lot is titled, you cannot start to build your new home and many builders will only hold their price for between 6-12months after contract signing. So if your preferred lot won’t title for another 12-18months, you have plenty of time to choose your dream home. With your land now selected, it’s time to finalise your home design and builder choice within your remaining budget. Once you’ve selected a floorplan and façade to fit on your lot, you will usually then have an appointment with a colour design consultant, to select all your interior fixtures, fittings and finishing touches. When working to a budget, it is important to remember not to get too carried away in your consultation, as it can be easy for upgraded items to blow out your budget quickly. It is a good idea to go to your colour consultation prepared and with some ideas. Prior to attending to your consultation, find images of colours and finishes you like, or even create a vision board to take along with you. Your builder should now put together your home design, all upgrades and inclusions, as well as your final site costs (if your lot isn’t titled, a provisional sum will usually be included), into a Building Contract. It is important you go through both your written contract and the final contract plans, to ensure you understand everything and they are exactly as you want. Also, you’ll need to check this all works within your allocated budget. If there are errors or you have gone over budget, now is the time to fix things, as many builders will charge to changes made after contracts are signed. Once your contract is signed, you will be required to pay your full 5% deposit and this is when you should provide your lender with your contract documentation. Once your block of land has titled, your builder will conduct a soil test and update any site costs (if required). Then they will arrange for all external approval, such as formalising unconditional finance approval for your construction with your lender, obtaining building permits, preparing the site for construction. It is now that your allocated building supervisor will make contact with you, as they will usually be your main point of contact during the building process. At last it’s time for your new home to finally start taking shape. Construction is broken down into several stages and you will usually be invoiced a percentage of your overall contract value at the completion of each stage. Once your home construction is complete, most builders will schedule Practical Completion Inspection with you. Don’t be rushed during this inspection, it is your final inspection when you sign on of everything, so if you have concerns or issues do not hesitate to voice them. With your final inspection completed and any required touch ups done, it is now time to arrange for the final settlement payment to be made. Tip: When booking removalists, allow a few days between your scheduled settlement and/or hand-over day and moving into your new home. Also remember it can often take a few days for water, gas and electricity to be connected, once you have selected your service provider. With your final payment now made, you will receive the keys to your new home. Your home will be covered by a range of guarantees, warranties and maintenance programs, it is important you familiarise yourself with these details and understand your responsibilities as the home owner, to ensure you do not do anything to void any guarantees or warranties. It’s now time to move in and enjoy your new home!